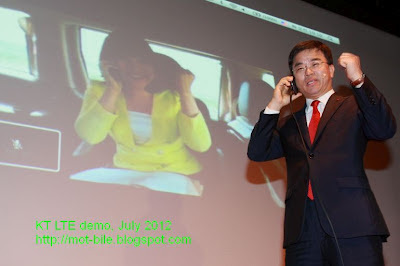 Korean MNOs are still scratching their heads to find the optimal pricing system for Voice over LTE. LTE has been around for a while, but voice is basically using older routes (VoIP, 3G...). VoLTE is not totally transparent for the user: theoretically, connections will come much quicklier, and sound quality will improve ("HD voice"). Of course, with the boom in smart device usages, the massive transfer of voice to data scares network owners. And the government is adding some pressure to prevent consumers from being charged too dearly (said consumers happen to vote for the next President this December). One thing is sure: unlimited plans will not be offered as easily, and operators cannot abandon totally the time reference (minutes). More than ever, in-network calling will be promoted. - "HD Voice" trials are under way for KT, with 300 testers and a target TTM of October 2012. - August 1, 2012: LTE-only rate plans (see below), LTE roaming. KT's LTE Warp, a service twice faster than standard LTE, already covers 84 cities nationwide, and all KTX lines. The operator aims at 4 million LTE subs by EOY 2012 (1.4 M nowadays), and stopped introducing new 3G smartphones. Note that Samsung Galaxy Note II LTE is also expected for October, and that KT's latest promotions are already preparing the transition, leveraging on the successful launch of Samsung Galaxy III LTE.
. LTE-1250 (25 GB, 1250 mn) adds a discount of KRW 33,000, plus KRW 32,000 for the smartphone, which adds up to KRW 141,667 per month (USD 123.2) over 2 years. If you replace your phone, KT throws in a lot of free on-network calls to keep you onboard. msnbc.com ceased to be yesterday. NBCnews.com takes over. NBC's mother company Comcast purchased Microsoft's half of a JV that sounded doomed from the start: You simply cannot build an internet powerhouse by leveraging on a non-brand at the commercial level. Unsurprisingly and according to Alexa today, MSNBC.com ranked #7,201 globally and #1,503 nation-wide. NBCnews.com definitely can't do worse than it does nowadays (#1,164,341 at the global level, out of the US charts). Note that NBC.com claims slightly better slots (respectively #1,925 and #735), far behind MSN.com (17th and 14th), but also behind its other offspring CNBC (#605, #194). CNBC stands for Consumer News and Business Channel, but I'm sure more people think it stands for Cable NBC or even for a JV between CNN and NBC. Anyway, CNBC does have a stronger identity than msnbc, and not only because of the capital letters: it's not a matter of reach but a matter of consistency. Well. Back in 1996, Microsoft was still barely scratching the surface of the internet, surfing on its young troyan horse Internet Explorer. 16 years later, it seems that Redmond eggheads still don't have much of a clue.